Many of us, campers, simply pack a pack of bottled water and forget about it. Others, though, who are more into the survivalism, rely on survival water filters or other water purification systems. Plus, if you know how to purify the water, you don’t have to carry around heavy weight, which is… water. This article covers not only 8 best water purification devices but also shows what water purification is all about. The tips you’ll learn from this article may be useful not only during your backcountry hiking trip but also in other life situations like natural disasters or other extreme situations. Thus, a backpacking water filter is not only for hiking. So, which survival water filtration systems out there are the most reliable and worth your money? Read on and find out the best portable water filter for you. 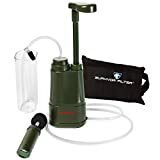 Survivor Filter PRO – Virus and Heavy Metal Tested 0.01 Micron Water Filter for Camping, Hiking and Emergency. 3 Stages – 2 Cleanable 100,000L Membranes and a Carbon Filter for Family Preparedness. 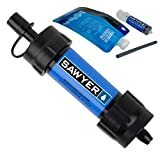 The Sawyer Products Mini Water Filtration System is a versatile device. It can be used in many ways. You can use it as a straw, use it to fill up your drinking bottle with the water or attach it to the end of the flexible straw of your hydration pack. You can also drink directly from the water source. It is extremely compact yet powerful. The water filter weighs only 1.4 ounces (~40 grams) and can clean up to 100 000 gallons of water. Simply amazing! The Sawyer Mini is super easy to clean – just flush the water backward through it several times using a special syringe and you are done – the filter is ready to be used again and again. This is one of the most popular survival water purifiers out there. And there is a reason for that. The filter is extremely user-friendly. It is simply a drinking straw with magical purifying features. This is why I decided to do a LifeStraw review. The filter is chemical free, has no batteries or moving parts. It effectively filters out bacteria and protozoa, which may include Cryptosporidium, for example. However, it does not filter out viruses. But you don’t have to worry about it if you travel in the States or Europe. If you are traveling to countries like India or other Asian countries, consider buying a chemical-based water purifier. Comparing to the previously reviewed Sawyer Mini, the LifeStraw Personal Water Filter is capable to filtrate only 260 gallons (~1 000 liters) of water. I consider it more as an emergency device because of that. The other thing which may be considered a disadvantage is that you cannot prepare a certain amount of thinking water to carry it with you, you only can drink THROUGH the filter. So, if you need to, you’ll have to carry the dirty water with you. This means that you will not be able to prepare the tea or soup using LifeStraw Personal Water Filter, however, you can use another filter from LifeStraw – LifeStraw Family. Click here to see the prices and reviews. This is what I call a military-grade water filter. The filter is 10 to 20 times denser than most other filters out there – it is 0.01 microns! The Survivor Filter Pro takes survival water filtration to a new level – it removes impurities and particulates all the way down to 0.01 microns. The filter features a state-of-art three-stage filtration process, which removes most bacteria and protozoa. Moreover, not like many others, the filter also removes some viruses and many other contaminants like heavy metals and chlorine. Insane, right? Without getting too deep into the scientific data, I can say that this is one of those filters which you may rely on in almost any situation. The filter uses a replaceable filter cartridge which will last for 260 gallons (~1000 liters). A carbon filet to reduce chemicals and bad smells. Some people report leaks between the parts of a filter. This is so probably due to the complexity of a structure of a filter. It has many parts, therefore, the risk of breakage is higher. 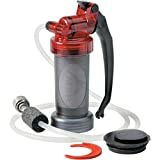 This probably doesn’t happen to many people because this camping water filter is one of the best sellers in its category. On the other side, the filter is very easy to use. The pump of the filter makes it easy to pump the water out of the source for purifying. Because the speed of cleaning is such fast, this filter is a great choice is you are traveling in a group. The lifespan of the filter cartridge is 520 gallons (~2 000 liters). The MSR MiniWorks EX Microfilter is a durable and well-designed hiking water filter. What I like about it the most is that it dramatically reduces the risk of getting bad things from water because it not only filters out the dirt and bacteria but also is able to clean chemicals and pesticides from the water. It is not a light piece of equipment, though. Weighing 18 oz (~510 g), it will also take up quite a lot of space in your backpack. So be sure to evaluate the type of your outdoor activities and decide whether you need a filter with such capabilities or you may do well with a simple personal filter like LifeStraw. The ceramic filter featuring a carbon core takes good care of bacteria, protozoa, and cysts. It also works well with removing chemicals, herbicides, and pesticides. This ceramic filter will filter out up to 520 gallons (~2 000 liters) of water. This filter is a bit slower compared to other filters of this type, but it is a water filter backpacking people simply love due to its usability. The Katadyn Hiker Pro Microfilter is one of the all-time bestsellers. Not without a reason. It is relatively light, small and effective. This water purificator effectively removes bacteria, protozoa, and cysts. However, it does not remove viruses from the treated water. The filtering technology is simple – the filter uses an AntiClog pleated filtering cartridge (made of glass fiber). The cartridge includes activated carbon granules. This personal portable water filter is quite easy to use. Some people, however, find it a bit tricky to hold the filter while pumping. But when you get used to it, it feels OK. The downside of the filter (if we can call it such, having in mind that the size of a filter is quite small) is small treatment capacity. With one cartridge it can filter only 200 gallons (~750 liters) of water when other similar filters do 2-3 times more. On the other hand, you can always have a spare cartridge with you. The speed of pumping is average. It will pump a liter of water within a minute and a half or so. This parameter is quite OK comparing to other filters. Filter type: AntiClog pleated cartridge made with 0.3-micron glass fiber + activated carbon granules. The Platypus GravityWorks 4.0 L Filter System differs from all the other filters reviewed in this article. I like the idea behind it simply because it’s simple. There is no pump in the filter – it uses only gravity – simply place a dirty water bag as high as possible and the water starts to flow to a clean water bag. Watch the video above to see what I am talking about. A great thing about this water purification system is that you can produce and store up to 2 gallons (~8 liters) of drinkable water. The speed of filtering is amazingly fast. This makes this portable water filtration system suitable for use in groups. 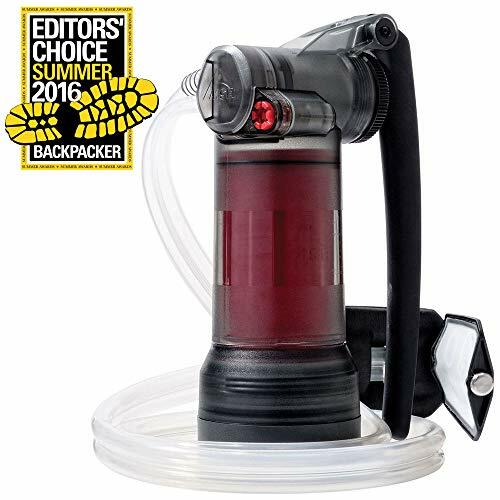 The weight and the size of the filtering system make it a perfect choice for hikers and backpackers. It takes up little space when packed. If you go traveling outside of so-called safe zones like USA or Europe, this filter is a must-have. This is the latest filter from MSR and it is super powerful. The MSR Guardian portable water purifier is the fastest filter comparing to all other filters in this article. It is also extremely easy to operate. This portable water filters not only bacteria and protozoa but also viruses. The only downside of this filter is the price. Prepare to pay several hundred dollars for it. But, on the other hand, you know what you are paying for. The filter requires totally no maintenance simply because it features a self-cleaning technology. The system simply back-flushes the filter with every stroke of the pump. Nice, huh? With this filter, you don’t have to worry about damage when it gets dropped or the remains of the water in the filter get frozen. The filter has withstood both tests! The treatment capacity which the MSR Guardian Purifier Pump delivers is a solid 10 000 gallons (38 000 liters). Not bad compared to some other filters from this article. The filter is a bit heavy, but its effectiveness and reliability beat these several extra ounces. Personal water filters are made to make out hiking trips more comfortable and to get us closer to nature. Sometimes a portable water purifier may save a person’s life. I have prepared this article in order for people to understand how water filters work and to see which one is the best for them. I hope the article will help you, who are looking to buy a personal water purifier and for you who already have one and want to learn more. Anyways, you may only end up getting the best hiking water filter if you try at least two or three. 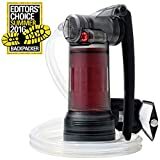 For backpacking freaks like me, I recommend having at least 2 different water purifiers – one for short 1-2-day trips, and the other one – for longer and more extreme trips. If you are traveling to countries with questionable water quality, always be sure to pack a water filter with the ability to filter out viruses. It may save you at least from a sick stomach for sure. Yeah, Amanda, Lifestraw is as handy as it can be. It is an amazing invention. I would never thought of something like this 15 or 20 years ago. 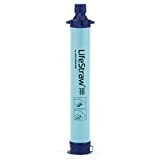 I use a Lifestraw personal filter. Man, this invention is simple, yet amazing. Back in the days, we had to boil water, etc. Now this small piece of gear helps save time and enjoy the nature. And thanks for a great article. I ended up here because I am looking for a filter of higher capacity for traveling with my family. Am considering now a Katadyn Vario Water Filter. I think, I’ll go for it :). Ain’t nothin’ better than to be sure your are on the safe side while in the wild. These gadgets surely give you such confidence. Got one recently and am happy like a kid! I have a Sawyer Mini, a FIXT, a Lifestraw, and a Lifestraw Go. I plan to try out all to determine the one I like best. Thank you for your very interesting article. I am now thinking about getting the MSR filter (the cheaper one since my financial situation won’t allow the more expensive one). You seem like a serious outdoors person! When you try them all yourself, you’ll know better than if you had learned something from an article.